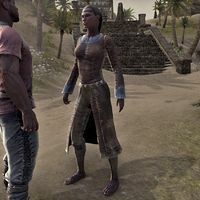 Abia is a Redguard found on the Sentinel Docks. She is the wife of Shazeem, and will only appear if you have completed the quest Washed Ashore on Stros M'Kai, and Shazeem joined the crew of the Spearhead. This page was last modified on 22 October 2017, at 01:32.